Spring Rolls are the greatest thing ever and if you live anywhere near Worcester, MA, I’d definitely recommend trying out Dalat on Park Ave. I went to college right around the corner and this little Vietnamese place has the best spring rolls quite possibly ever. 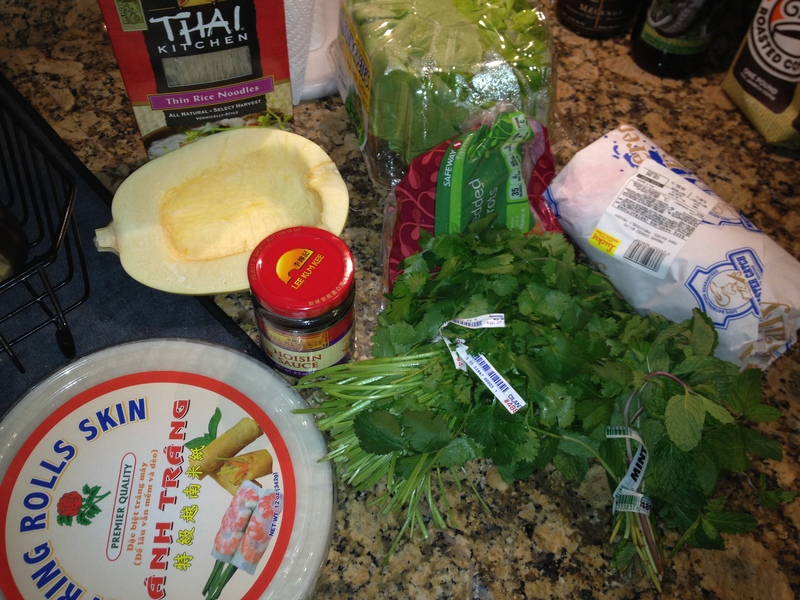 That’s where my love affair of Vietnamese Spring Rolls (and Vietnamese food in general) began. Now that I’m on the other side of the country, one of the greatest things about living in San Francisco is that there are spring rolls basically everywhere. I decided one day that I wanted to try to make these myself (or perhaps it was my boyfriend’s idea – he is obsessed), and it turned out to be a success! They are fairly time consuming to make, but require no oven and if you make enough, they can be an entire dinner. 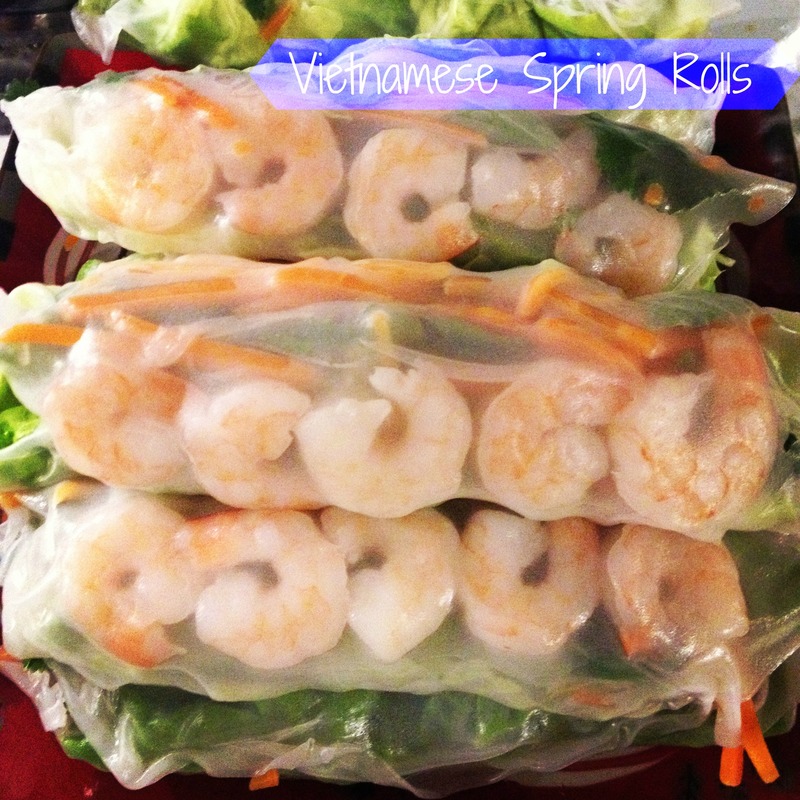 I combined a few different recipes to come up with the below recipe and matching peanut sauce, so this is my take on Vietnamese Spring Rolls. They’re great as an appetizer or if you make 4-5 per person, you’ll have a dinner. I used this stuff called PB2 for the sauce (which is amazing – basically powdered peanut butter that you add water to – and only about 45 calories and 13 calories from fat) and it makes the sauce recipe a lot healthier. 1. 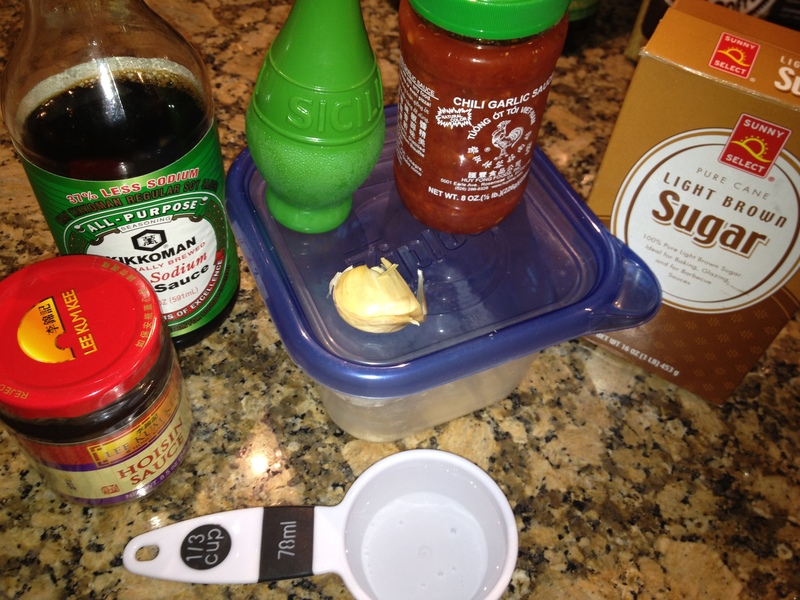 Prepare peanut sauce by mixing together all the sauce ingredients. 2. Cook about 1/3 of vermicelli package according to the package instructions (very easy, only takes about 10-15 mins total to cook). 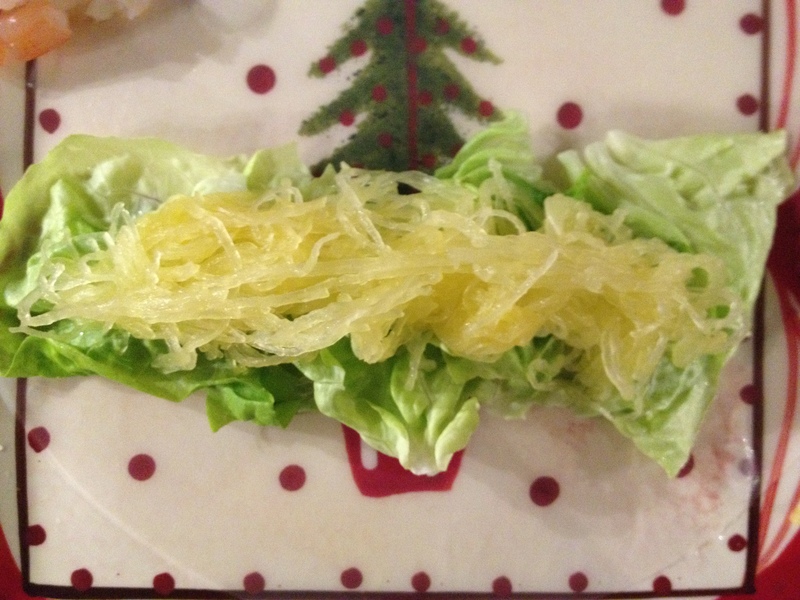 You can also sub this with some spaghetti squash (as pictured) if you’d like. 3. 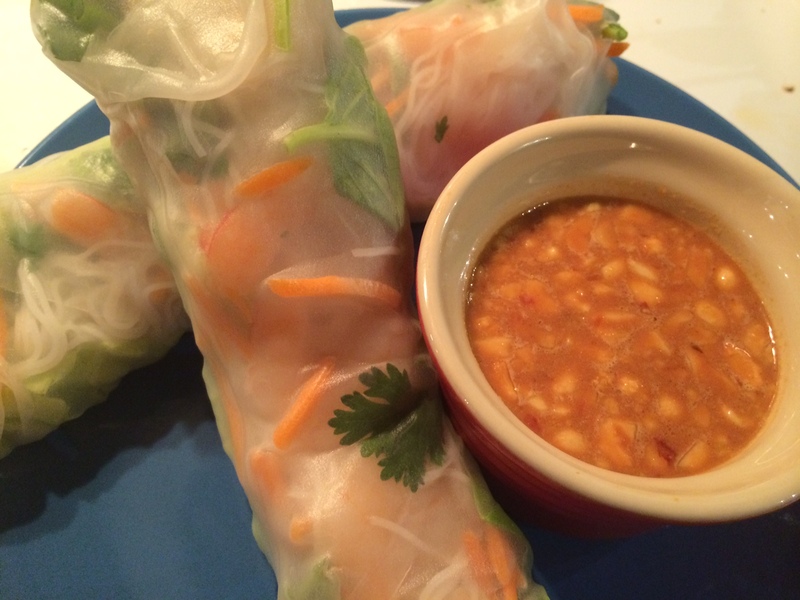 Let peanut sauce and vermicelli cool in the refrigerator for about 15-20 minutes. 4. Once everything is “prepped” you can start making the rolls. 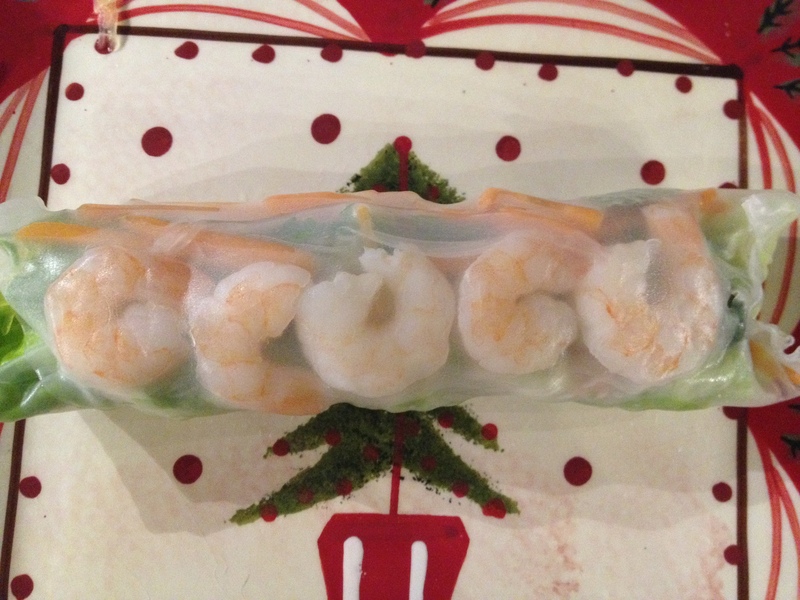 Fill a big bowl with water and dip the rice paper in one at a time for about 15-20 seconds until it is soft and pliable. 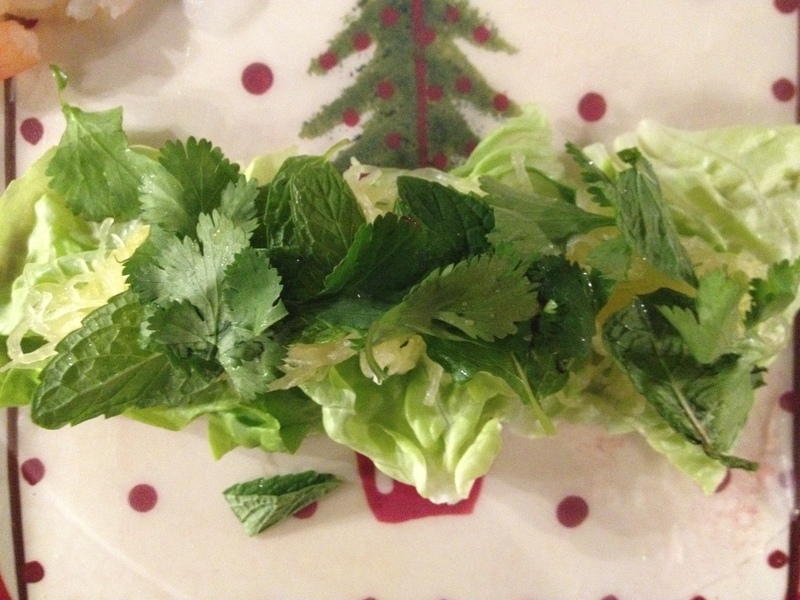 Remove from the water, shake it out gently, and place it on a damp plate. 5. 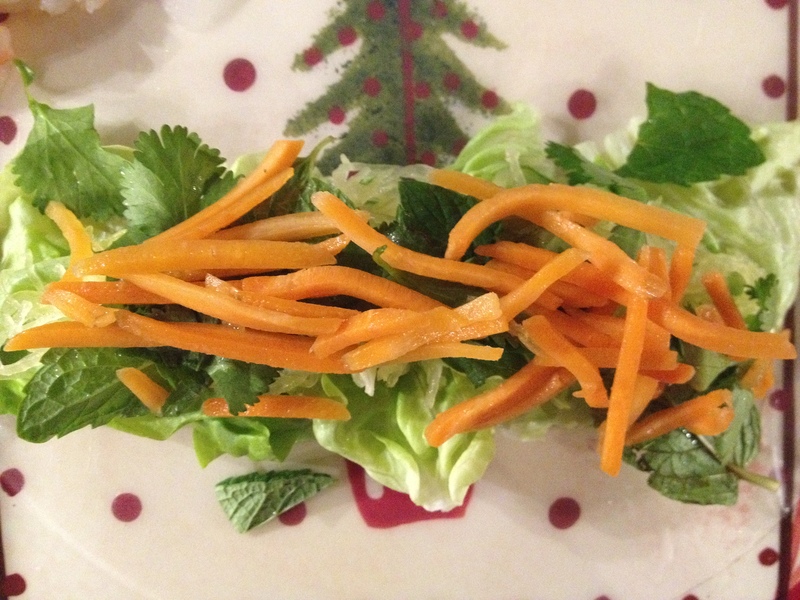 Add a leaf of lettuce, some basil, mint, cilantro, shredded carrots, vermicelli, and shrimp all on top of each other. Pictures below. 6. Tightly roll the ingredients into a cigar shape and close in the sides. This step takes a a few tries! It will be pretty sticky, and you might get a tear or two, but you’ll get the hang of it! 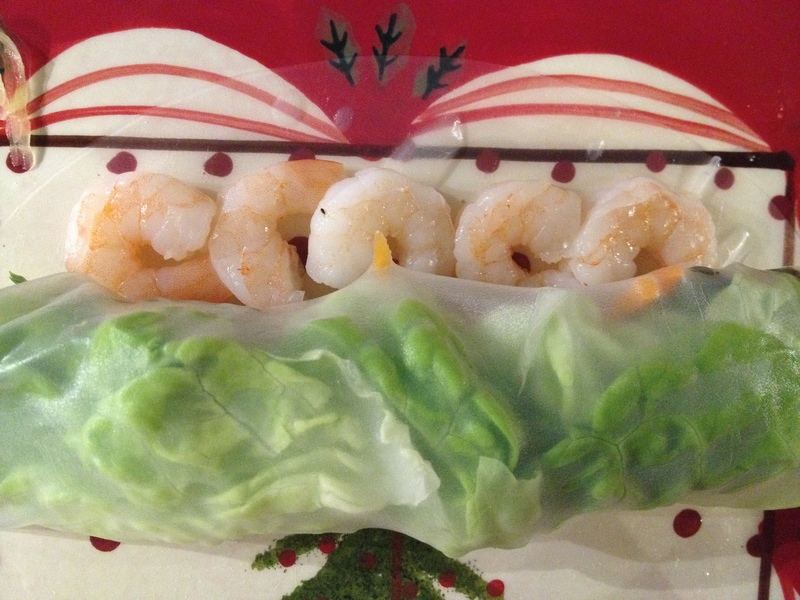 I LOVE spring rolls. I had a go-to place for them in college too! I need to get ambitious and try making them myself.